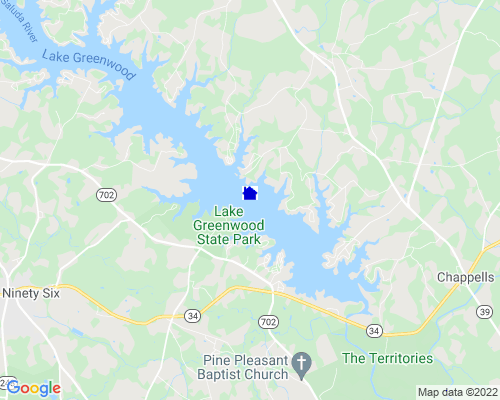 If you’re in search of lake homes for rent in South Carolina, look no further than Lake Greenwood. Sprawling across Greenwood, Laurens, and Newberry Counties, Lake Greenwood has served as one of the state’s most prized recreation destinations for more than seventy years. The lake and dam not only stand as a testament to American perseverance and ingenuity, but they also prove that outdoor fun never goes out of style. Fishing is as it should be on Lake Greenwood: an intimate affair. The lake offers 11,000 acres of water surface to fish, making it easy for anglers to navigate and search out their favorite spots. Anglers flock to the lake all year long to enjoy the mild weather and the premium fishing: perch, bream, crappie, catfish, and bass populate the lake in healthy numbers. Use any of the easily accessible boat ramps downstream from the dam to fish for striped bass—they’re an especially popular catch. Lake homes for rent encircle Lake Greenwood and have access to its 212 miles of shoreline. Lakefront properties dominate the shoreline landscape, and 125 paved campsites put you close to all the water sports and recreation opportunities you cherish. Even off the water, there’s no shortage of adventures to have. The sudden burst of blooming wisteria each year attracts admirers from March into early April. Lake Greenwood even welcomes modern day treasure hunters to plunder booty in the form of geocaches. Lake Greenwood is conveniently located near many major urban and cultural hubs. It's only 60 miles from Columbia, SC; 65 miles from Augusta, GA; and 170 miles from Charleston, SC, so lake-view homes are secluded but never out of the way. Similarly, one is never too far from his or her next best round of golf, as more than ten quality courses reside in the Lake Greenwood area. If you’re interested in living on a Lake Greenwood golf course, visit GolfHomes.com for property listings. Constructed by the Civilian Conservation Corps (CCC) in 1940, the Lake Greenwood State Park is proud of its inception in history and continues to honor its roots by preserving such relics as the Drummond Center, a classic example of CCC architecture. Similarly, it’s no exaggeration to say there’s a different festival for each weekend of the year, from Ware Shoal’s Catfish Festival to Uptown Greenwood’s photography-centric Click 646 Collective. Indeed, good times never go out of style at Lake Greenwood. Water Level: Average water level variance? In September the lake starts being lowered and is lowered considerably in February, which is when most people work on their docks. Then it is immediately raised back to full pool. Boat Docks: Are they permitted? Boat docks are permitted in all areas except a few areas considered to be a habitat area.